Otoplasty Pricing: How Much Does Ear Pinning Cost? For children and adults alike, cosmetic ear surgery (Otoplasty) is an excellent way to correct aesthetically atypical ears, yielding boosted self-confidence that rewards the patient for the rest of their lives. While Otoplasty may not be the first word that comes to mind, those who’ve lived a life of unfavorable name-calling such as ‘Dumbo ears’ or ‘elf ears’ may be more inclined to the common ear surgery procedure. According to statistics from the American Society of Plastic Surgeons (ASPS), the national average cost for an Otoplasty is $2,965. However, it’s important to note that this cost is an estimate and does not factor in the common surgery-related expenses or geographic location, and these can vary dramatically. The primary variables that affect total cost are the complexity of the procedure, the surgeon's experience, surgical facility fees and surgery-related expenses. The cost of an Otoplasty will vary widely per patient, so it’s essential to make sure you are looking at the costs in the right light. When it comes to your appearance, you want the best care possible, not the least expensive. The most extensive and invasive form of Otoplasty is reconstructive ear surgery. As such, it usually costs more than other Otoplasty procedures. Reconstructive ear surgery is a complicated procedure addressing deformation or traumatic injury to the ear. It often involves taking skin and cartilage from other parts of the body to augment a patient’s existing ear structure with the purpose of creating a natural-looking ear. Resulting in a longer operating time, longer recovery time and more involved post-operative care. In general, these reconstructive procedures are covered by insurance. Insurance does not usually cover cosmetic correction of ears that are prominent or stick out too far. It’s safe to say that cost can significantly influence why a patient chooses to have a procedure done by one surgeon over another. All surgeons have their approach to performing different surgeries as each doctor has different amenities at their disposal and varying levels of experience and accreditations. The cost of anesthesia for an Otoplasty can vary significantly for each patient. If undergoing general anesthesia, you want to make sure your anesthesia is administered by a board-certified anesthesiologist or a CRNA (nurse anesthetist). If a surgeon uses a non-certified anesthetist nurse or a medical assistant to push the anesthetic drugs (and yes, unfortunately, this does happen), then your safety may be at risk. The cost for anesthesia is typically billed by the hour, and you should ask in advance what happens if the surgery goes longer than expected, and who will pay the extra anesthesia time. Otoplasty procedures can sometimes be performed under local anesthesia for minor corrections, and this can limit the cost to the patient if an anesthesia practitioner is not required to be present for the operation. Surgical facility fees are an important factor to consider not only because of overall cost but because it may put a price tag on the importance of your safety and satisfaction. The importance of having your procedure performed in an accredited surgical facility by qualified staff is critical in the decision-making process. 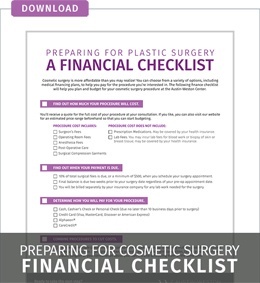 Do not try to cut costs by sacrificing safety and having your procedure performed at a non-accredited practice or by a surgeon who not certified by the American Board of Plastic Surgery. The Austin-Weston Center for Cosmetic Surgery includes five fully-equipped surgical suites. These operating rooms are fully accredited by the Accreditation Association for Ambulatory Health Care (AAAHC), an association that certifies outpatient surgery centers. Our surgeons are board certified in plastic surgery and are fully insured, our Certified Nurse Anesthetists (CRNAs) are nationally certified by the Council on Certification of Nurse Anesthetists and all personnel is licensed and certified in Advanced Cardiac Life Support (ACLS). After calculating the cost of surgeon's fees, anesthesia, surgical facility fees and all other expenses, the cost of Otoplasty often reaches a total between $6,750 and $9,000, if not more. Many people don’t have this amount of money at their immediate disposal, but when the decision is made that it’s the right time to undergo the procedure, it becomes necessary to consider financing options. Practices almost always accept credit cards, but patients should carefully consider the associated interest rates of all available options. Also, several third-party financing companies deal exclusively with those who want or need treatments that are not covered by insurance. While cost is obviously an important consideration when it comes to surgery, it is not the most important one. Patients should remember that their health and cosmetic satisfaction are ultimately the top priorities. Choosing an inexperienced surgeon in order to save some money could cost far more in the long run if they require a corrective procedure or if they develop serious health complications.